1) Three folding joints can ensure free changing of angles and can adjust the height and position of lens. 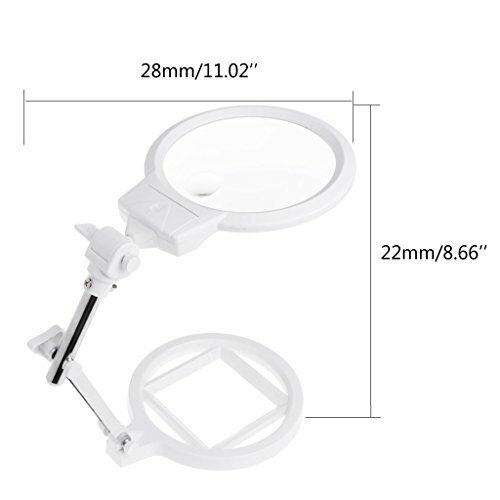 2) This magnifier's lens is designed with frame, so that the lens can be not fraied, and be used long time. This magnifier is a ideal tool for people who are invoved in fine work such an coins, stamps, jewelry, emproideries and so on. 3) Plotting scale of the base can be used to measure the actual size of objects very conveniently. 4) With two LED illuminating lamps, it can also be in normal operation under insufficient sunlight environment. 5) With three pieces of AAA batteries, large capacity, this model can continuously discharge more than 10 hours, expediently be used. ✿Three folding joints can ensure free changing of angles and can adjust the height and position of lens. ✿This magnifier's lens is designed with frame, so that the lens can be not fraied, and be used long time. ✿Plotting scale of the base can be used to measure the actual size of objects very conveniently. ✿With two LED illuminating lamps, it can also be in normal operation under insufficient sunlight environment. ✿This magnifier is a ideal tool for people who are invoved in fine work such an coins, stamps, jewelry, emproideries and so on. If you have any questions about this product by Hukai, contact us by completing and submitting the form below. If you are looking for a specif part number, please include it with your message.